The National Security Agency is deleting more than 685 million call records the government obtained since 2015 from telecommunication companies in connection with investigations, raising questions about the viability of the program. The agency released a statement late Thursday saying it started deleting the records in May after NSA analysts noted “technical irregularities in some data received from telecommunication service providers.” It also said the irregularities resulted in the NSA obtaining some call details it was not authorized to receive. 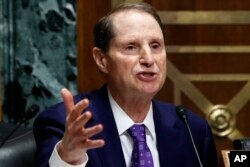 Ranking member of the Senate Finance Committee Sen. Ron Wyden, D-Ore., asks a question of Secretary of Commerce Wilbur Ross during a committee hearing on tariffs, on Capitol Hill, June 20, 2018, in Washington.